It isn’t too late to start your seeds indoors! Spring seems right around the corner, but for us in Ohio, we’ve still got a while. The last frost date in my area is listed as April 20th, but local gardeners always go by the Mother’s Day rule for spring planting. With that date in mind, we’ve got 8 weeks until we can plant outdoors – which just happens to be the perfect amount of time for tomatoes & peppers. Here’s a few tips for starting your seeds. Refer to your garden plan – or make a garden plan if you haven’t done so already. It’s quick & easy to do and ensures that you have enough of the supplies you need when it gets to planting time. Select suppliers – there are tons of seed & seedling companies out there, do some research to find a good intersection of quality products with great pricing. Determine last frost date – this is the most important thing unless you’re growing under cover of a greenhouse, or using frost blankets. Check out your last frost date here. Check planting instructions & set a planting date for each crop – this is important so you don’t have pumpkin vines growing in your closet in March! Location, Conditions & Care – make sure you have a location that will get 8-12 hours of sunlight or from grow lights. Keep your seed trays in a well-ventilated area that is around 70 degrees for optimal germination. And finally, be sure that you are checking daily for water, fertilizer needs, and turning trays if seedlings are reaching. There is nothing more satisfying than watching the seeds you’ve sown, sprout & evolve into the plants in your garden – and eventually become the salsa in your fridge! Stay tuned for more gardening tips through the spring & season. And drop me a line if there’s something you are curious about and I’ll tackle that issue in a future post – thanks & happy gardening! Winter is a sad time for most gardeners, unless you have a greenhouse or some other structure to extend your growing season. There is always something you can do during the offseason to better prepare yourself for a successful springtime. Here are a few steps you can take, and projects you can work on to maximize your yields, minimize your waste, and Garden for Gains. Pick the plants you want to grow – This seems like an easy task,but there is so much out there that you could grow! Do you want to grow fruits, vegetables, herbs, annuals, perennials, or trees or all of the above? No matter what your growing aspirations are, you can accomplish them with a plan. Research your growing zone, your last frost date, and the germination times of the seeds you select to sow. Develop a farm plan with propagating, transplanting, & harvest schedules – It’s better to keep your seedlings inside or under cover until the threat of frost has passed. After that, transplant away! If you do run into a late frost you can cover your plants with frost blankets or make cloches – a mini greenhouse made by cutting a plastic bottle in half. 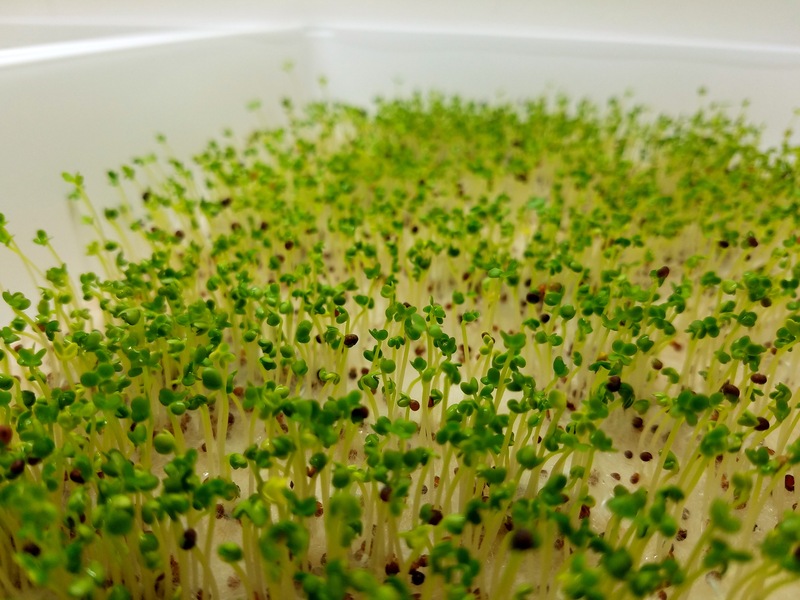 If you plan on having a steady supply of fresh produce, then you’ll want to calculate how many trays to seed, how much space those seedlings will eventually take up, and decide how much of your space you would like to dedicate to each crop. Decide on a fertilization method – I think most gardeners tend to wing it in this area of gardening – spreading manure or granular fertilizer with no regard to what is actually necessary. Talk to your local Extension Agency to get a soil analysis. This will give you a true profile of the available nutrients in your soil along with the knowledge you need to supplement your plants’ needs. Order tools & supplies – This is the fun part, but not always the easiest. Everyone’s first instinct is to go to the big box stores like Lowe’s, Home Depot, Menards, etc. but I encourage you to go to your local garden center or nursery to get expert help from someone who also has the horticultural bug. My personal first & only stop is my place of employment AM Leonard (also have our sister company Gardener’s Edge). We have just about everything you can think of that you need to grow or landscape along with our own line of high quality tools – give us a call some time! The past few weeks have been a blur; so hard to believe that I now own a home. I was on the house hunt for about 2 months. Thought I wanted to buy a house in my hometown, but then kept getting hung up on the “what ifs” and the anticipation of the future. I stopped looking for a couple weeks, got my mind right and just started making a list of houses I wanted to see. I found quite a few that were in my price range, had good potential for a few key areas: live-ability, garden-ability, & a good investment – that way I could worry about the future in a more realistic way. If the “what ifs” came to fruition, you have to be able to turn a house around and hopefully profit. All of that aside, I made a list of about 10 houses from Tipp City to Piqua – my hometown is Sidney which is just north of Piqua and I had seen about 6 open houses and wasn’t finding anything that spoke to me. A few of the houses really peaked my interest, but it wasn’t until the last house where I really felt that “I’m home” feeling. Ironically enough, my realtor sent me an email the morning of the day that we were going out to visit houses, and it was the first day that my current house was on the market. That was the only one that I looked at in Piqua, and was the last one on the tour that day, and I just knew that it was the one. Attractive price point, good potential house that didn’t need a ton of work – just basic maintenance, some paint, and a vision for the future projects. Of course my starred project was the garden. Everyone who came to my house complimented the size of the backyard and my only reply was “yeah, it’ll look a lot better once I rip up all this grass for the garden”. And so I did. I started digging the first bed out with my all-steel AM Leonard spade (15” blade) and learned that the soil wasn’t too bad on the top layer – but a decent amount of clay and found a few rocky patches, including what I think are 2 arrowheads. 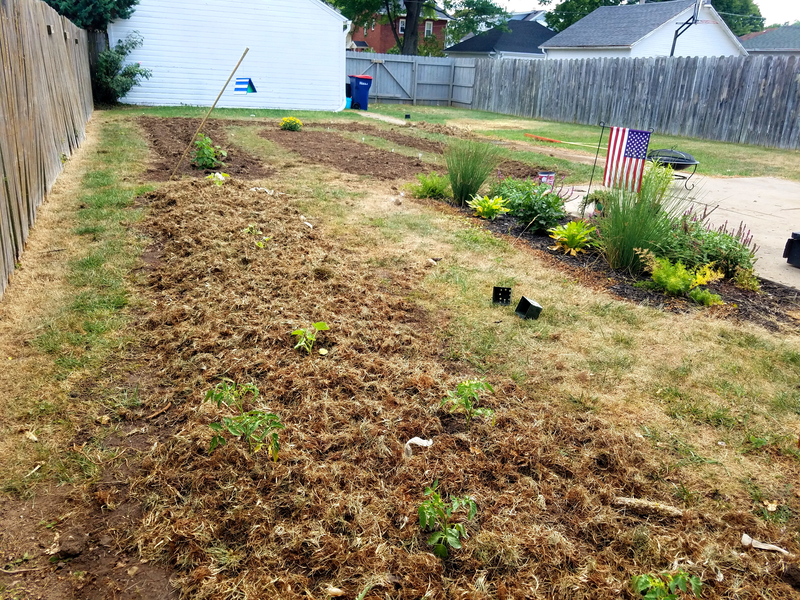 Because of the amount of clay that was deeper in the soil, I incorporated sphagnum peat moss into the areas where I was planning beds – just enough to fluff the soil and break up some of that clay. -4’x18’ strip for late-season tomatoes and cantaloupes. I’m thinking about trying to train the cantaloupe up a stake, never tried it before but excited to test vertical farming out! -4’x22′ with the first 6 feet of the bed dedicated to the future growth of a golden raspberry bush and then 2 rows of cucumbers 16 feet long. One variety is called Pickle Barrel Hybrid and I will set up a trellis for that side, while the other row is a variety called the Picklebush and those – as you might have guessed – grow more like a bush. -4’x16′ is the size of the bottom of the U and that has 2 rows of corn called “Baby Corn Bonus”. This should be harvested in 30-40 days and will be awesome in a stir fry! Also have a few rows of Garden Beans – had some for dinner tonight and they taste awesome, nothing better than a good homegrown meal! -3’x22′ completes the U and I filled that with a mixture of “Space Hybrid Spinach” and “Dwarf Blue Curled Vates Kale”. -A 4.5’x20′ rectangular “I” sits inside of the U and that is loaded with herbs: Bouquet Dill, Cilantro, Greek Oregano, & Dark Green Italian Parsley. We wrapped this bed up with a colorful mixture of Carrots & German Giant Radishes. Tomatoes: growing strong and recovering from the 90-100+ degree days we have been having the last 7-10 days. Cantaloupe: starting to expand their reaches and they have their “feelers” looking for something to hold onto – hopefully I can train them up a bamboo stake and save some space. Cucumbers: sprouting and looking healthy! The Rest: other things I planted should be coming up within the next couple of days, especially with all the much-needed rain we have gotten the past few days and hopefully we will get a little later in the week as well. No other method irrigation compares with a good soaking rain. I’m happy with how the Garden of Gains II has shaped up so far. This is a pretty good-sized garden but the planting flew by with Kyla there to help out. Usually I garden alone, but it is definitely nice to share your passion with someone you love. And you learn a lot about each. You work together. You build something. You are assisting in the creation of something. The key thing is that you do this all together – as a unit, as one. Or at least that’s how it was with me and Kyla. There is never a moment when we can’t find a solution to our problems. It doesn’t mean that we don’t encounter problems, but when both people strive to be the best person for their person then you have a special relationship. We are all just out here Gardening for Gains.